All information is correct at time of printing. Printed April 2019 For up to date information please see hinchinbrookway.com.au or the specific businessâ&#x20AC;&#x2122; website. All listings are subject to change without notice. By Air Cairns and Townsville International Airports all service regular commercial arrivals and departures. Both airport terminals have a range of car rental services. Charter flights are also available from both Cairns and Townsville to Ingham. Ingham is a comfortable 3 hour drive from Cairns or a 1 hour and 20 minute drive from Townsville. THE HINCHINBROOK WAY? The Hinchinbrook Way reflects the enviable lifestyle of the Hinchinbrook Shire, North Queensland. A lifestyle set against a backdrop of mountain peaks, mighty waterfalls, cane filled floodplains, wild islands, iconic fishing, tropical reefs and pristine coastline. The Hinchinbrook Way taps into 60,000 years of culture, sharing Indigenous and Immigrant stories where cherished traditions are passed down through the generations. It indulges you with culinary delights from the farm gate, Italian inspired delicatessens and the chance to learn the secrets of Nonnaâ&#x20AC;&#x2122;s authentic pasta sauce. The Hinchinbrook Way introduces you to our story tellers weaving an inspiring journey that promises to leave you yearning for the next chapter. The Hinchinbrook Way Logo and colour palette represents the diversity of the shire and inspiration for the future. Each colour element represents a themed icon. â&#x20AC;&#x153;The Hinchinbrook Way Logo and colour palette represents the diversity of the shire and inspiration for the future. Each colour element represents themed icons.â&#x20AC;? From the Hinchinbrook Visitor Information Lounge your journey takes you out across an elevated walkway suspended above wetlands and walking through the canopies of raintrees. The walk meanders through the incredible offerings of TYTO before descending past inspiring art works and into the town centre. Wander through the townâ&#x20AC;&#x2122;s boutique and gourmet shopping experiences, before looping back through the serene TYTO Parklands. 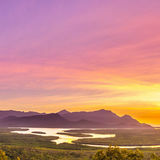 The Hinchinbrook Way Drive spirits you along country roads lined with towering cane, that link the tropical towns, the high set Queenslanders, the historic pubs, the beaches, the rivers, the wetlands and the wilderness. Come and discover the stunning countryside of the Lower Herbert district, its characters, products and experiences. Immerse yourself in the Hinchinbrook Way with two themed journeys that provide the perfect introduction to the lifestyle and natural beauty of Hinchinbrook. Birds of TYTO TYTO Wetlands is named after the Eastern Grass Owl, Tyto longimembris. This unique and majestic species is a nocturnal master of the wetlands. Their superior eyesight, flight capabilities and ability to walk through tall grasslands make them deadly hunters. Eastern Grass Owls camouflage their nests on the ground, making a nest chamber with a tunnel runway leading out of the tall grass. The owls range in size from 32 cm to 42 cm in height with a wingspan from 100 cm to 116 cm, comparable to the height of an average 6-year-old child. World War I was fought very close to home. With danger imminent, local young men joined the Militia or Citizens Military Force. The World War I local militia was a Company of the 31st Battalion, with personnel coming from Townsville, Bowen, the Burdekin, Charters Towers and Ingham. To discover the story of the 31st Battalion, Kennedy Regiment, visit the mini Military Museum, located within the Hinchinbrook Shire Library, TYTO. Piemonte to Queensland â&#x20AC;&#x201C; Cesare Costanzoâ&#x20AC;&#x2122;s journey The name Costanzo is common in Casale Popolo, but in Ingham, the name is only borne by two families. That one of those families is here, bears witness to the courage of Guiseppe Costanzo, who following World War I made the long journey alone to Australia in the hope that he would make enough money to raise the fares for his wife and children to join him. A living was scarcely to be had in the rural countryside surrounding Casale Popolo, a village just 14 kilometres from Conzano, in the province of Alessandria in Piemonte. By 1927, storm clouds of discontent that would lead to an unimaginable World War II were already brewing. 16 year old Cesare Costanzo found nothing to be optimistic about as his tummy rumbled and his young back strained as he carried and laid bricks. Grimly determined to better his lot, he decided to follow his father Guiseppe. Cesare followed not only in his fatherâ&#x20AC;&#x2122;s footsteps but in those who since 1891 had been leaving the harsh economic conditions of Piemonte to labour in the cane fields of tropical North Queensland. There, there were jobs to be had and money to be made. For Cesare and his family the gamble of migration paid off. He purchased a shop in the small township of Trebonne, his sister a delicatessen in Ingham and his son, in time, would become a Councillor of the Hinchinbrook Shire Council. Mario Torrisi – a gentleman of the flashing blade It is a long time since cane cutters toiled “like heroes” “to gather in the harvest” but Mario Torrisi is determined that the unique way of life and work of the heroic cane cutter is never forgotten. Post World War II Australia experienced an economic boom and immigration was again encouraged, particularly of the Displaced Person Refugees, Italians and Spaniards. These groups were regarded as the saviours of the cane industry in a time of over full employment when it was nearly impossible to entice local young men into the cane fields. Immigrant ships plied the seas between Europe and Australia, one being the Toscana on which young Mario Torrisi travelled with little more than a suitcase and hope. After emigrating from Sicilia – Giarre province, Catania Italy, Mario arrived in Sydney in January in 1951 and by June was a ‘new chum’ cutting cane in North Queensland. Mario had a daily routine that was dirty, back breaking and even dangerous at times, and included laying the portable rail, loading the previous day’s rake of cut cane, cutting the next rake, and finally burning for the next day’s cut. By 1962 Mario was no longer a ‘new chum” cane cutter but a loco driver at Victoria Mill. There he witnessed, from another perspective, the transition from hand cutting to mechanical cutting and the final exodus of the cane cutter from the cane fields. The Herbert River, crossed twice during the Hinchinbrook Way drive is mighty when in flood, but a gentle meandering sandy river through all other times. Originating high on the Atherton Tablelands, the river flows east 150km through the rugged Herbert River Gorge and out across the floodplains providing the fertility for the Hinchinbrook regionâ&#x20AC;&#x2122;s farming before culminating at the southern end of the Hinchinbrook Channel. Built in 1903, the original hotel burnt down in 1928 and was rebuilt as a two storey concrete building in 1929. In the floods of 1967, over 2 metres of water flowed through the bottom rooms of the hotel, so many locals took refuge on the upper floor, where drink service was maintained! Current publican, Douglas Barrie, is a noted local historian who has researched the crash of the Texas Terror, a US Liberator Bomber, on Hinchinbrook Island in 1942. Dominating the surrounding landscape of Macknade is the 70m high chimney stack of the Macknade Mill. A pioneering mill first established in 1874, it has the capacity to crush up to 1.82 million tonnes of cane in a season. The mill plays a vital role within the local community. Not only is it a significant local employer, but within its grounds it boasts an idyllic nine hole golf course spread amongst giant raintrees and a vibrant local bowls club. Backed by 3 kilometres of deep natural mangrove covered tidal flats, Lucinda is almost an island unto itself. For anglers, photographers and families it is the perfect destination with access to unrivalled fishing experiences, long sandy coastline and stunning scenery. The contrast of the rising or setting sun, golden beach, calm sea and backdrop of Hinchinbrook Island juxtaposed against the engineering marvel that is the Lucinda Jetty makes for a composition that even amateur photographers will delight in. A beach that extends well beyond the horizon, beckoning the beachcomber, dog walker or romantic. With a backdrop of tropical islands, spectacular views and an ocean full of wonders, why wouldnâ&#x20AC;&#x2122;t you take a sunset stroll along this spectacular coastline? Finish the day with a cold beer or wine by the Coral Sea at the local pub or chill out on the beach with a hand full of fresh fish and chips and watch the stunning colours of a tropical sunset. in stories crafted over millennia. Feel the magic of tropical rainforests, wilderness beaches and thundering waterfalls. Catch a wild barramundi under the gaze of rugged mist-bound mountain peaks. For every adventurer, family, foodie, culture vulture, angler, nature lover and history buff; the Hinchinbrook Way has an experience you’ve been looking for. A truly great experience makes us fall in love with a place and a way of life. FISHING Getting out on the water is the ultimate way to experience the diversity of Hinchinbrook's iconic fishing amongst picture postcard scenery. Within a one hour radius of Ingham the full spectrum of world class recreational fishing opportunities are on offer, including beach fishing off the pristine Hinchinbrook coastline, wharf fishing from Lucinda and Dungeness, sweet-water fishing in the rugged Herbert River Gorge, Barramundi fishing in the tranquil waters of the Hinchinbrook Channel, or classic open water fishing on the Great Barrier Reef. Italian Food - Immerse yourself in the aromas of Ingham’s Italian inspired delicatessens and stock up your pantry with the very best local produce and imported Italian delicacies. Seafood - Local fishmongers and seafood cafe’s take incredible pride in sourcing locally sustainably caught seafood; presenting the freshest delights from the Coral Sea! Local Produce - Sample unique local produce, including Jourama Farms Gourmet Mushrooms, Bellasato Farm Heritage Breed Chickens and the extraordinarily rare and delectable varieties of Damree Honey. High Tea among the Flowers - High tea (and coffee) amidst flowers is just one offering from the quaint florist shops of Cartwright Street, Ingham. Exploding with flavour, guided by rich cultural influences with produce garnered from farm gate and backyard plots. Plunging 268m, Wallaman Falls, Australiaâ&#x20AC;&#x2122;s highest single drop waterfall is an experience not to be missed. Viewing its sheer size and tranquility is easily accessible from the lookout; however to truly appreciate the magnitude of the falls a trek to the base is a must for the more adventurous! Located just 20 minutes south of Ingham, in an idyllic rainforest setting is Jourama Falls. The perfect destination for campers, photographers and bird lovers alike. For the swimmers, deep shaded swimming holes and shallow streams bordering the campgrounds are the perfect escape on a hot tropical day. Immerse yourself into the calm infinity pools of Zoe Falls. Gaze out across the rich tropical vista comprised of deep green rainforest, rugged blue mountain peaks, the long white curving beach and the tranquil deep turquoise sea. Once you have been consumed by the trinity of Zoe (Zoe Bay, Zoe Beach and Zoe Falls), you will likely never find a comparable nature experience. Thorsborne Trail (3-5 days) Hinchinbrook Island’s rugged Thorsborne Trail is one of the World’s best multi-day walking experiences. The trail traverses an incredible diversity of terrain, from rugged tropical peaks, stunning coastal beaches, rocky shorelines, melaleuca swamps and patches of eucalypts and rainforest. As the trail winds its way 32km south from Ramsay Beach to George Point it intersects many of the islands iconic destinations including Nina Peak, Zoe Bay and Mulligan Falls. For the ultimate experience walk the trail from north to south and book your boat transfers to and from Lucinda. This option delivers a stunning early morning one hour cruise of the incredibly photogenic Hinchinbrook Channel en route to Ramsay Bay. The beauty of this option is once you have finished the trail it is only a 15 minute transfer from George Point back to your transport, hot showers, hot meals and a cold brew! This difficult 10km track was used by three local Indigenous groups to cross the Cardwell Range. Later transformed by early European settlers into North Queensland’s first road suitable for wheeled traffic. The stone pitched bridge still located there today at the summit of the walk is the oldest surviving example of civil engineering work on mainland North Queensland. Standing tall above the surrounding eucalypt woodlands, the secluded Mount Fox crater is formed from an ancient volcano. Take the time to trek up rugged walking track to reveal spectacular views of the surrounding Kangaroo Hills and countryside. If you’re lucky enough you may even encounter the endangered Sharman’s RockWallaby. Orpheus Island, a paradise for nature lovers; home to over 1,000 different vibrant and colourful marine species. For the snorkelling enthusiasts Yanks Jetty (located at the southern end of the island) is the ideal launching pad to explore the fringing coral reefs. The Great Barrier Reef, the worldâ&#x20AC;&#x2122;s largest living structure is only 35km from the Hinchinbrook Shireâ&#x20AC;&#x2122;s coastline. Renowned for it snorkelling, diving and whale watching experiences. TYTO WETLANDS The TYTO Wetlands are open daily and are free to explore. Explore on your own or take a tour with our expert guides. The most rewarding experiences for wildlife are found in the early morning or late afternoon. 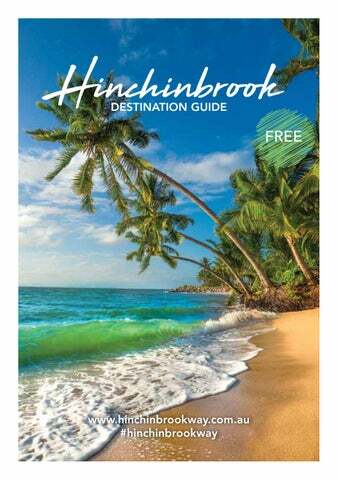 Maps, bird lists and local tips are available from the Hinchinbrook Visitor Information Lounge. Donâ&#x20AC;&#x2122;t forget to take water, a hat, sunscreen, insect repellent and your camera. In case of emergency call 000. Culture A mix of ancient Indigenous traditions and European pioneering, representing no less than 23 nationalities form a wonderful tapestry of cultural experiences and stories. Immerse yourself in the colourful annual celebrations at the Australian Italian Festival; discover the incredible stories and way of life of the Nywaigi People at Mungalla Station. Step back in time with a visit to the Herbert River Museum in Halifax or take a guided history tour of the Sugar Tracks at TYTO. Bequeathed to the Hinchinbrook Shire Library by local historian for the 31st Battalion Infantry Association, Capt. Bob Burla RFD, ED & Bars (RL). The Kennedy Regiment Library has become a major custodian of the documentary heritage of the 31st Battalion, The Kennedy Regiment. The mini Military Museum honours and celebrates the 31st Battalion Kennedy Regiment and the Spirit of Gallipoli in the 100th year anniversary. TYTO Parklandâ&#x20AC;&#x2122;s hosts the relics of the past through a collection locally used and sourced historic sugar cane memorabilia. See how things were done and learn Hinchinbrookâ&#x20AC;&#x2122;s contribution to the pioneering of the sugar cane industry within North Queensland. Cultural Experiences Mungalla Experience Mungalla Aboriginal Tours opens the history books of the local Indigenous Australians, The Nywaigi People; Jacob Cassady is a fantastic storyteller and sits at the heart of the Nywaigi Bookings people showing you their p.85 traditions and cultural background. Offering a range of tours you can experience the history of the Nywaigi People, experince the incredible taste of a Kup Murri (earth oven) dinner and enjoy live contempory Indigenous Music Mungalla Station is a successful Indigenous enterprise, a multi-award winning tourism destination and an iconic Australian cattle station. Herbert River Museum and Gallery Discover and identify the glorious background of Halifax and how it became one of Hinchinbrook's historical rural town by visiting the Halifax Herbert River Museum. Take a step back in time as a treasure chest of historical artefacts surround you, learn and absorb how the town foundr's and families have influenced Halifax and the Hinchinbrook Region to what it is now. Ingham - Inspiring public art, gorgeous boutiques shops, delicatessens, markets, cafes, art galleries, local produce stores, walking trails and world class nature experiences. Forrest Beach - A beach that extends well beyond the horizon, with a backdrop of tropical islands beckoning the beachcomber, dog walker or romantic. Halifax - With its quaint heritage buildings set amongst shady mango trees, Halifax could easily be described as Queenslandâ&#x20AC;&#x2122;s quintessential tropical heritage village. Trebonne - Derived from the French phrase very good, Trebonne is the gateway to the regions wilderness experiences. Lucinda & Dungeness - The perfect destination for anglers, photographers and families. Access to unrivalled fishing experiences, long sandy coastline and stunning scenery. Taylors Beach - An escape from the world, a place of serenity, where you can wander tidal flats or kick back and cast away. By discovering our local destinations, you can discover so much more. 3km east of Ingham. Tiled mausoleums portray the areaâ&#x20AC;&#x2122;s Mediterranean influences. Taylors Beach Boat Ramp provides ideal access to Victoria Creek and Yanks Jetty (Orpheus Island). Beach side parklands with modern amenities, swimming enclosure and childrenâ&#x20AC;&#x2122;s playground. For the fishing enthusiasts, a series of benches and rod holders have been installed along the foreshore. Low tide leaves behind a fascinating tidal flat, allowing individuals to walk out long distance from the shore line. A short coastal stroll along the foreshore, past unique hedged mangroves. Centrally located park with modern amenities and a half court (basketball). Stretching 14km, this tropical beach with idyllic island views is the perfect place to while away a lazy afternoon. Located right on the beach, with modern amenities and direct access to the ocean swimming enclosure. Located right on the beach, with gazebos, outdoor fitness equipment and half court (basketball). Coastal walk from Forrest Beach Boat Ramp to Forrest Beach Hotel. Play a game of tennis right next to the beach! The court is open to the public and there is no charge for use. With the appearance of being held together by two rusty nails, the very quaint and photogenic weatherboard clad Trebonne Post Office has been operating untouched for almost 100 years. Listed on the Queensland Heritage Register, the Pelota Mano (handball) court constructed in 1959 is a rare illustration of the presence of Basque culture in Queensland. The court comprises two reinforced concrete walls and concrete slabs on the ground and is particularly significant for its rarity as the only purpose built handball court constructed in Queensland. Time for a game of handballâ&#x20AC;Ś The court is open to the public and there is no charge for use. Centrally located park with modern facilities, playground and picnic shelters.